Here is a amazing track, with 2 different parts plus one little riff. Thanks to a great melody, this song sound like a big machine that can’t stop. The chords and the rhythm are not diffcult but the challenge here is to keep the tempo until the end. “Help!” is one… Look at the courses here! In the Courses section is the list of all the availables courses. 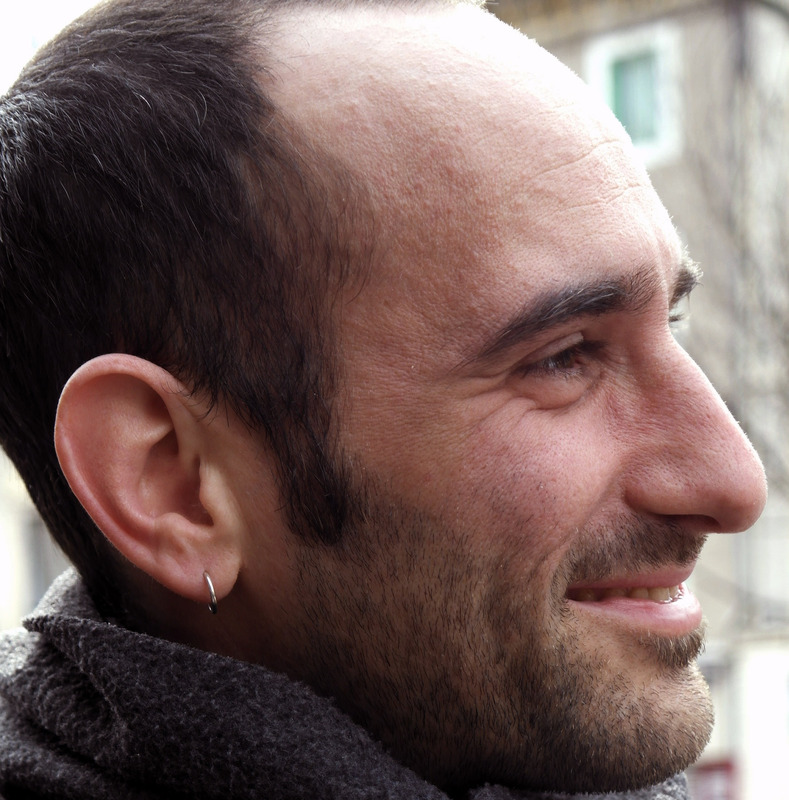 These video courses are exclusively visuels, with 2 close up views of the 2 hands. The theory courses and the exercises help you to begin and to have a good understanding of the rhythm and the harmony. The practice is made through the studies of songs where I invite you to work on my personal arrangements. The Tab section allows you to access to the course materials in the form of Guitar Pro and Pdf tablatures by signing up to the “Tab! Access”. The Pack section allows you to download the video courses and to sign-up to the “Full Pack”. In the Demos section are grouped all the demos related to the studies of songs. The Members Area allows you to login to access all my online courses as well as to download the packs and to get the tablatures. 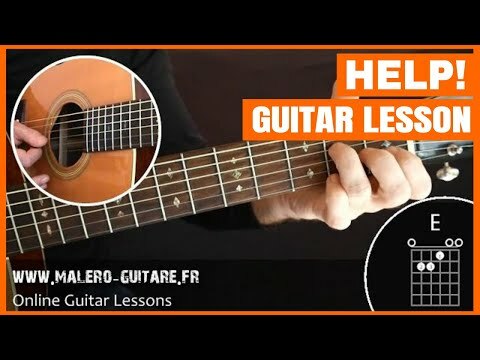 In this video, I give you some explanations about the site, the courses concept and about my approach of the guitar : who, when, where, why et how ? Here are all the answers ! It is a long time I was looking for a way to play this song in the spirit of its original recording, when I found an unplugged version by Sting himself and alone, playing the guitar and singing. Here is exactly what he was doing… more about this song, courses, tabs and chords here ! Thanks you to give me ideas of new lessons in the courses requests page. 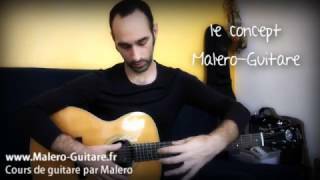 For any question, message or comment, you can use the comment boxes or send me an e-mail at malero@malero-guitare.fr. If you encounter troubles with the site, look at the Faq. I have always been interested in the sound and the style of the acoustic guitar. As soon as I started to play at the age of 15, this instrument fascinated me and I immediately tried to reproduce the intros, the riffs and the strummings I heard on the discs and on the radio. Of course, as a newbie, I murdered a lot a songs before beginning to get something good :-), but I was playing a lot and I could make rapid progress. 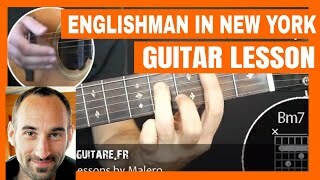 I am a self-learner, I make my own ear transcriptions, I learned to read chord charts and tabs and to understand the harmony rules and of course, I practiced a lot ! Here is certainly the reason why I decided to create the site, by surfing to the internet and by looking for videos to catch new playing skills, I thought I could teach the way I learned : looking, listening and repeating.